Image of interview is not available. Sorry for the inconvenience. Recently, Fahrenheit was interviewed about their New Album's sale. With their new style in both image and music, their CD "Yue Lai Yue is selling great and they are very happy with their success. However, preparing and promoting a new album requires a lot of hard work and can be extremely stressful, Therefore, Fahrenheit's record company has decided to let Fahrenheit go for a SPA to release their Stress. " I am actually afraid of massages because they are very ticklish, I am not afraid of the pain, I'm just very ticklish." says Jiro. Later on the interview, Fahrenheit was asked about their thoughts on other artists achievements overall. " I think we should all respect an artist/musicians hard work, because not only do they put their heart to their music and productions, they also try to do their very best during promotions as well." replies Aaron. 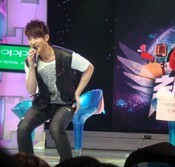 During their promotion events, Fahrenheit also attended a cancer campaign, Wu Zun could feel what the cancer patients were feeling. " When my mother was suffering from Cancer, I tried very hard to help her and to give her hope, but I think the most regretful thing was that I never actually felt or did was to be able to understand or know what she was trying to tell me. Every time she was trying to tell me something important, I felt sad and told her not to tel lme. I feel very unhappy and regretful for not being able to know what she was trying to tell me before she left." explained Wu Zun. or anybody know the dowlload link? ?